It is looking very likely that the midwest and great plains will see major severe weather, with the likelihood of strong long track tornado in Kansas and Oklahoma. Many of the tornado may be wedge tornado, which can stay on the ground for an hour or more and be a half mile to mile wide. As a now saturday looks to be the worst of the two days. 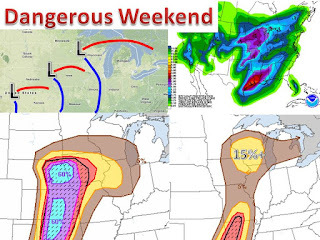 The Storm Prediction Center (SPC) has already put a "high" for severe weather on saturday. They use the "high" risk about 5 times a year. Last time the high risk was included in a day 2 outlook there were over 90 tornado reports. This truely could be a historic April 14th, especially with the highest risk area in the most populated section of Kansas and Oklahoma. The closed low then progresses up into the upper Mississippi River valley and brings warm moist air along with it. The severe risk will shift into MN, IA, IL, and WI. large hail and damaging winds appear to be the largest threat here. The SPC has a slight risk for severe weather, mostly because its 3 days out. I would expect this to become a moderate risk as confidence grows. A moderate risk is very uncommon for these areas, maybe 3-4 times a year.